Welcome to the first edition of J-Bo’s Favorite Things! I thought I’d share with you all of the awesome things I’ve been doing to keep myself feeling human-ish during this most polar of vortexes. It’s a great read. I highly recommend it if you want to be taken back, quite vividly, to the feelings of your own first love story. (For me: the boy in middle school with whom I carried on a relationship exclusively through AOL until he eventually got so mad at me that he tried to rip my arm out of its socket like a wishbone. Ah, to be young). I’ve watched this video so much now that I’ve started to think of the woman as my bestie, since I spend more time with her and her perfect abs than I do with most people in my life. But also, she has such a slamming body that I also kind of hate her with a deep burning jealousy that keeps me up at night hoping that terrible things will happen to her. In other words, it’s pretty much like every female friendship ever. Last but not least, I’ve been querying literary agents for my book and watching The Bachelor. 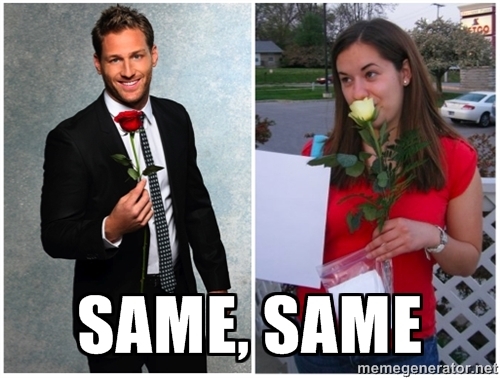 I group these two activities together because querying is shockingly similar to being the Bachelor, in which I am Juan Pablo and the agents are my lady suitors. Except that instead of me gradually eliminating them until I identify my one true love, they all get to take turns rejecting me. And instead of fighting over who gets to make out with me and take me on a fantasy date, none of them want to look at or speak to me. Because they don’t know I exist. And I’m competing with thousands of sexier versions of myself. And there are barely any roses. And instead of one heartbreak, I get to go home crying in the limo again and again. Over and over. See? The similarities are uncanny. Please let me know, readers, if you have any documentary or YA book recommendations for me. Or predictions of who Juan Pablo will spend his life with. Or if you are an agent who can land me a six-figure deal. Or just let me know how you’ve been keeping busy this miserable winter. Yes, I do have a recommendation for a documentary. See ‘2016: Obama’s America’ AGAIN because when I took you to see it, you thought I had tricked you into believing it was a chick flick. You spent all 89 minutes humming with your hands over your eyes. So, I’m guessing it didn’t take. How about a documentary on how the guy who made that movie is now being sent to federal prison? Your comparison with The Bachelor – right on. I’ve heard the whole thing is scripted, the outcome is known at the outset, they never really marry, so querying is even more like the show. Maybe I’m just not romantic enough. It’s definitely tough to maintain momentum while querying. Also, last night I dreamed that I was on The Bachelor but I got bored and left. Hopefully my querying won’t have a similar fate. Good luck to us!! Check out a documentary called 20 Feet from Stardom. It’s about backup singers in the music business. Fascinating. It’s up for an Oscar this year. Haha- I actually JUST watched that tonight! Thanks for the recs!! I will definitely look into these. Let me know if you come across any other good ones. I have so many recs you don’t even know. John Green, Veronica Roth, and James Dashner are all popular authors right now, but then again, when are they not? I will restrain myself and not give you any more recs, but if you’re looking for anything specific, hit me up. Yayyyyy, thanks! I have barely scratched the surface of YA books so far. The only ones I’ve read are The Fault in Our Stars (AWESOME), Openly Straight (alright) Eleanor and Park (AWESOME) and I’m currently reading The Tragedy Paper. I could seriously read about teenagers falling in love for the rest of my life, especially when they are at boarding schools. Where were all these YA books when we were YAs?? Oh, also, have you tried the Irene Goodman agency? http://irenegoodman.com/about.php I recommend Beth Vesel. Sadly, no. My friend is just repped by that agency and they are pretty killer. Beth handles memoirs. Nice. I’ll give her a try after I rework my query letter, which is clearly ineffective. I’ve decided to market my book as YA memoir, which is apparently barely a thing. Let me know if you can think of any agents who might be open to such a thing.